“My name is Adam Meltzer. The last thing I remember was being stung by a bee while swinging at a robot-shaped piñata on my twelfth birthday. I was dead before the candy hit the ground. Adam is dead. He has crawled out of his coffin, dug his way out of his grave and is dropping soil all over his mums new carpet. He hates himself for this – and hang on, new carpet?! He is disgusted at his new zombie way of being but he has to find out what happened, solve his own death, and resurrection, and he needs to do it before someone else gets hurt, or joins him in the living dead camp. With the help of his new vegan vampire friend Corina and the chupacubra Ernesto, he will get to the bottom of his own demise, and it can’t kill him, because he’s been there and done that! What a hilarious and fun book! It was just what I needed when I was a bit down and tired and it brought light to my depressed lunchtimes at work after such an amazing weekend last weekend. This book is guaranteed to bring a smile to anyones face and you will be laughing throughout if you know whats good for you! This was my first Jeff Norton book and his ability to bring voices to life as you read seems to be an impressive one. All the characters in this book had their own unique way of talking and I loved that right from the get go. The characters themselves are funny, bright and pretty cool. You have Adam who is totally OCD and trying to get over the fact he hates his slimy zombie self whilst trying to find out what happened to make him that way. Corina is a bit overwhelmed at whats expected of her and takes it out on the whole world. Ernesto needed a little more about him but I did enjoy his input on the conversations. I think one thing that was fantastically captured in the books as the brother-sister relationship, which was so scarily like my own relationship was with my brother at that age – expect he wasn’t a zombie. The story is fun and it reads like the first in a series, setting up a possible strand of exciting things for Adam and his friends to explore. Its perfect for the age range with ease of following and a lot going on without overwhelming the reader. younger readers in the 8 to 12 age range are sure to enjoy it. The best thing by far in Memoirs of a Neurotic Zombie was the humour. Adam, like I said, is a zombie with OCD tendencies so theres a lot to laugh about with his comments about everything being gross. The attitude of the characters and the situations they got themselves into made me laugh too and I absolutely adored the puns they came out with. This book was a bit of fun for me and something I would pick out when I’m feeling down because of the happiness it holds. I think a lot of kids will absolutely love it and I really do recommend it! 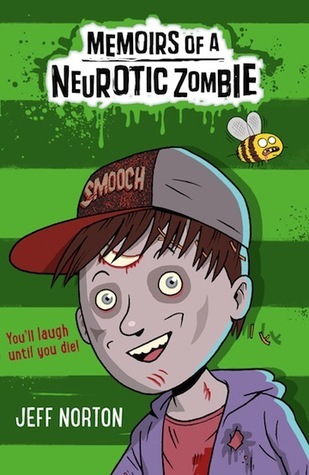 Memoirs of a Neurotic Zombie will be published on August 7th by Faber and Faber. My copy was sent from the publisher in exchange for an honest review.